As babies, Grizzly Bears appear cuddly, playful and approachable. As as matter of fact, they are truly delightful to watch when they play. Like any animal, you will certainly see varying moods and personalities. However, where there are baby Grizzly Bears, there is sure to be a mother Grizzly Bear ready to defend her cubs at the least provocation. With the exception of mother and cubs, adult Grizzly Bears are solitary creatures and prefer to be left alone. You may see a gathering of Grizzly Bears at a stream of salmon, but they do not come to the stream for company, they come to eat. It is always best to leave a Grizzly Bear alone. Because of their acute sense of smell, they know you are in the woods with them before you know they are with you. Grizzly Bears rarely hunt humans. They actually avoid contact with humans, but if you get too close to their food or cubs, you certainly could find yourself in grave danger. Grizzly Bears are powerful, frightening, huge, beautiful and magnificent! I will not lie, if I happened to be frolicking in the woods and a grizzly bear popped out from behind a tree, I would be scared lifeless, but I still think they are gorgeous creations! I am perfectly content to love them from afar and I have no desire to experience a real bear hug. Did you know their claws are up to 4 inches long? Weight: 800 - 1500 lbs. Even though they are huge, a Grizzly bear can run up to 35 miles per hour. Only about 1,000 grizzly bears remain in the contiguous US today and they are protected by law. It is believed that many grizzlies still roam Alaska, where they are pursued by big game hunters. 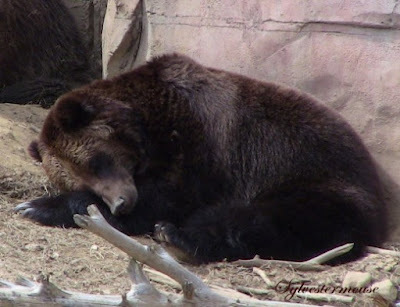 Grizzly: The Bears of Greater YellowstoneCheck PriceGrizzly bears hibernate during the winter months. A mother bear will give birth during the winter, so it is not unusual to see a mother bear and her cubs out foraging for nuts or berries during the early spring. While the cubs are adorable and appear cuddly, it is best to stay far away from the mother and her babies. She will attack in order to protect her cubs. Remember, if she smells a human, she won't know that you just want to take a picture of her pretty fur baby, she will believe you want to take the cub. She will attack first and ask questions later. A mother bear cares for her cubs for up to 2 years. Because of the males solitary lifestyle and a cubs long term dependence on their mothers, females only give birth every 3 - 4 years. This infrequency in childbirth contributes to their threatened status. Grizzly bears have brown fur with grey grizzled tips, thus the reason they are named Grizzly Bear. Although as much as 90% of what they eat is made up of fruits, nuts, berries, leaves, or roots, grizzly bears do have a carnivores digestive system and they do eat other animals. Grizzly bears tend to rule the forest. If they encounter another animal with it's "dinner" the other animal will leave the meal to the bear instead of risking it's own life. Unfortunately, most hunters either do not understand this "agreement" or they are not willing to give the bear their "trophy." This will result in the bear attacking the human even though a grizzly bear would normally avoid contact with people if at all possible. Since a grizzly bear is territorial, he will return to the same place to eat. He will go back to the same stream each year for salmon or to the same field each season for berries or fruit. If he finds food at a campsite once, he will return again and again in search of additional meals. Unknowingly a camper may seal the fate of a cute little bear by intentionally leaving food for them. Since the cub will grow up and continue to return for nourishment, a forest ranger may be forced to put him down in order to protect unsuspecting campers. Please DO NOT feed the bears! Even if he is adorably beautiful! "When you dance with a grizzly bear it is best to let him lead." Hunters are at greater risk than the average hiker. Grizzly Bear are intelligent enough to know that if they hear a gunshot, there is likely to be fresh meat. They will follow the source of that smell and sound to steal the game. 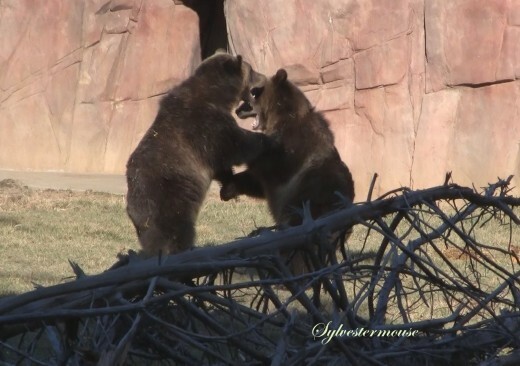 A Grizzly Bear will fight a hunter for the food and the hunter is unlikely to fair well. It is best for the hunter to allow the Grizzly Bear to have his prize. I assure you, that trophy is not worth the cost of a up-close and personal Grizzly Bear encounter. At that point, you are both there for survival and survival is the priority. In a battle, the Bear will win! Please, just walk away to hunt another day. Grizzly Bear are powerful animals and they are actually beautiful to observe. The photos in this article were taken at the Memphis Zoo where there is a large area with a waterfall, swimming area for the Grizzly Bear and plenty of area for them to inhabit. These Grizzly Bears came to the Memphis Zoo as babies in September of 2009 and the photos were taken in October of that year. 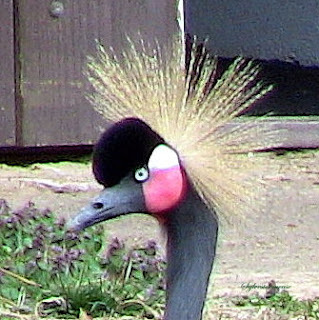 The Teton Trek in the Memphis Zoo is their home and they often appear as interested in looking at the zoo visitors as we are of watching them. At other times, the Grizzly Bears appear to be totally unaware of any spectators and perfectly content to ignore human presence. When I snapped the photo below, I couldn't help but wonder if they were talking about us. To say that I adore Grizzly Bear, would be an understatement. I am fascinated by them! They often walk with such grace and have the appearance of peace and tranquility. But, I know they are massive, powerful creatures who are easily the master of their domain and I am content to observe from a distance. 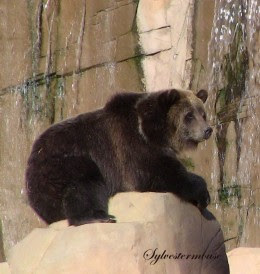 Image Credit for Photos, Print / Poster, Binder & Grizzly Bear Gifts logo are photos by Sylvestermouse. All of these Grizzly Bear photos are the exclusive property of Sylvestermouse and should not be copied without permission. However, they are available through Zazzle if you would like to purchase one. Grizzlies are indeed impressive, and though I'd prefer not to meet one in the wild I'm glad we humans haven't yet completely removed their natural habitats. The pair in the pool couldn't fail to make me smile. I agree, they look like they are enjoying a gossip! Grizzly bears certainly are adorable. Very glad there was plenty of room between you and the bears when you were taking pictures! Interesting to learn that grizzlies understand that gunshots mean fresh meat, though I'm not at all surprised that they'll take on a hunter, even one with a gun, to fight for the prize. Thanks for the interesting grizzly bear facts! What a fun, informative article. I love reading about wildlife, and enjoyed your photos. Fascinating story about the Grizzly Bear. I wonder where it got the name 'grizzly'? That's so interesting. Thanks for enlightening me. Now I want to go visit a zoo and see a grizzly up close so I can see the silver grey markings. A 'zoo' visit is the closest I want to get to a 'real' Grizzly...lol.